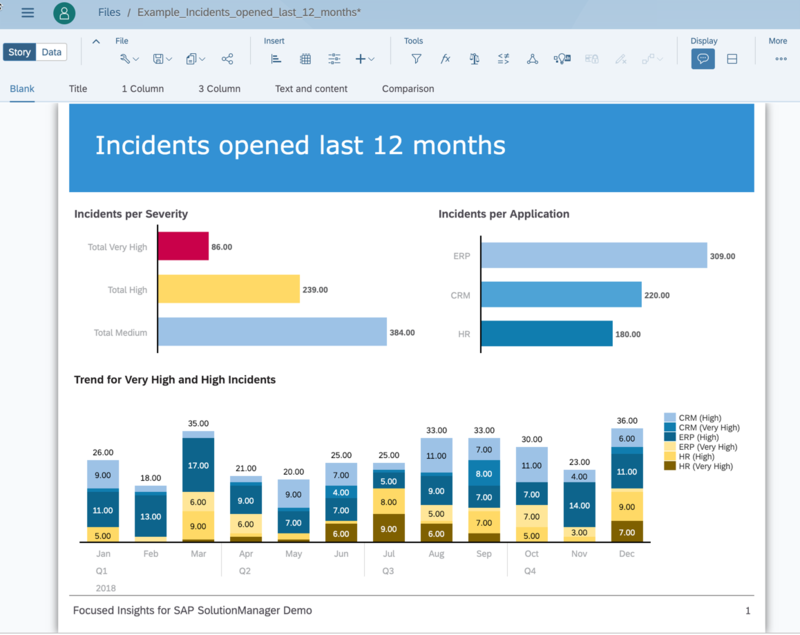 SAP Analytics cloud is one of the best platforms around to build dashboards and predictive analytics in the cloud. This is a recommended choice to consolidate data coming from multiple sources whether they are on the cloud or on premise. SAP Customers who want to feed the SAC with SAP Solution Manager analytics, can already rely on existing data sources like the Live BW or the Import BW but there may be some cases where the expected metrics are not easily accessible. Moreover, the direct access to SAP Solution Manager’s BW requires time and expertise, which can prevent customers from progressing. Focused Insights for SAP Solution Manager now offers a simple generic SAC interface. With this interface, any metric available in Focused Insights can be intuitively published to the SAC. To expose metrics to the SAC, we just need to build a gadget in an OCC dashboard. In the example below, the gadget shows the number of tickets per application during the last 12 months. There are 3 applications (ERP, CRM, HR) with 3 types of severity (Very High, High, Medium), thus we expose 9 time series in the gadget to cover all combinations. It has to be noticed that the type of chart and the visual representation is not important, only the data matter. By switching to the edition mode, we notice that each gadget come with a unique identifier called the gadget’s id (here 2892). This is also the key we’ll need later on to access the gadget’s time series from the SAC. 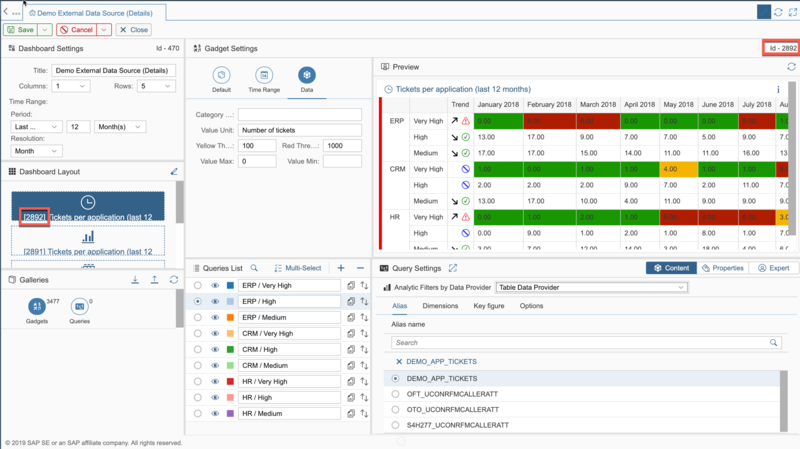 As another interesting angle of this example, metrics come from a custom ticketing application, and data are actually stored on a custom database table located on a managed system connected to SAP Solution Manager. Thus, SAC BW connection cannot be used and bringing the data to the SAC could require advanced configuration with direct access to the managed system’s database; direct database access is not always easy or authorized in a productive environment. Now, since the data is available from Focused insights, it is easy to get it in the SAC as we’ll see in the following. 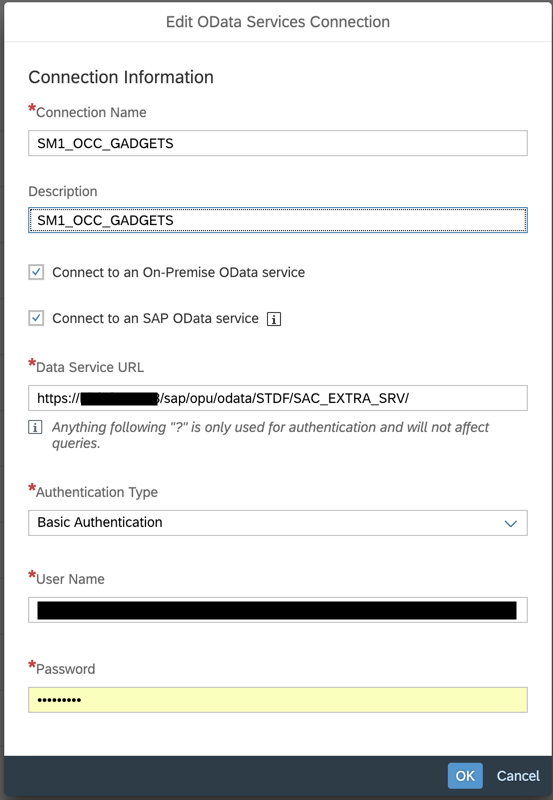 On the SAC side we first need to create an ODATA connection to the SAP Solution Manager and Focused Insight dedicated SAC service. This connection has to be created once and can then be re-used with multiple models. As always with SAC, the next step is to create a model based on the ODATA connection. This is at this point we need to indicate the OCC gadget’s id in the query. Dimensions and key figures are automatically detected, we just need to indicate the type Date for the dimension “Date” and save the model. Nothing different than for any other SAC model. 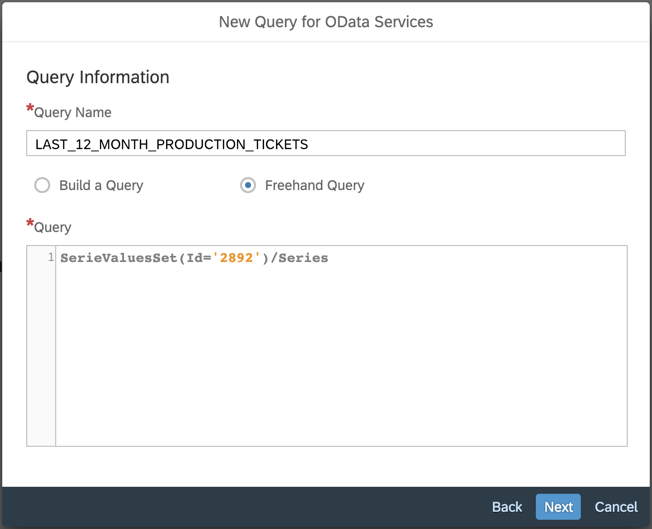 Since it is an ODATA connection, the data are imported in the SAC database for offline access. We can schedule a job to regularly update the model from SAP Solution Manager; a monthly job should be enough since this is the period of the time series in this example. Once the model is ready, we can use it to build Stories and benefit from all great features of the SAP Analytics Cloud.